If you are looking for a delicious, healthy, and low-calorie salad recipe, you are in the right place! 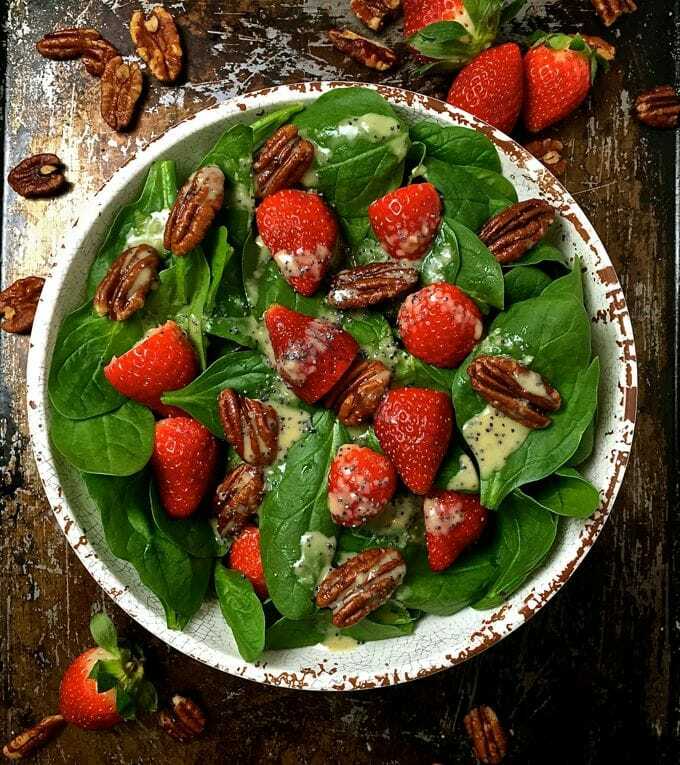 Spinach Salad with Strawberries and Pecans with my homemade poppy seed dressing is a great choice when you are looking for a quick and easy dinner idea. I make this salad often when we are in the mood for something light and easy for dinner, and it’s excellent as an entree or as a side salad. 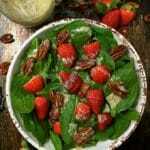 Versatile Spinach Salad with Strawberries and Pecans is also a great choice for a brunch or lunch. And if you would like to add a bit of protein, you could add a little goat or feta cheese, or cooked chicken or even bacon bits. You can also mix things up a bit and substitute your favorite nuts and maybe try pistachios or walnuts, or for the fruit, how about orange, pear or mango slices. Anything goes! 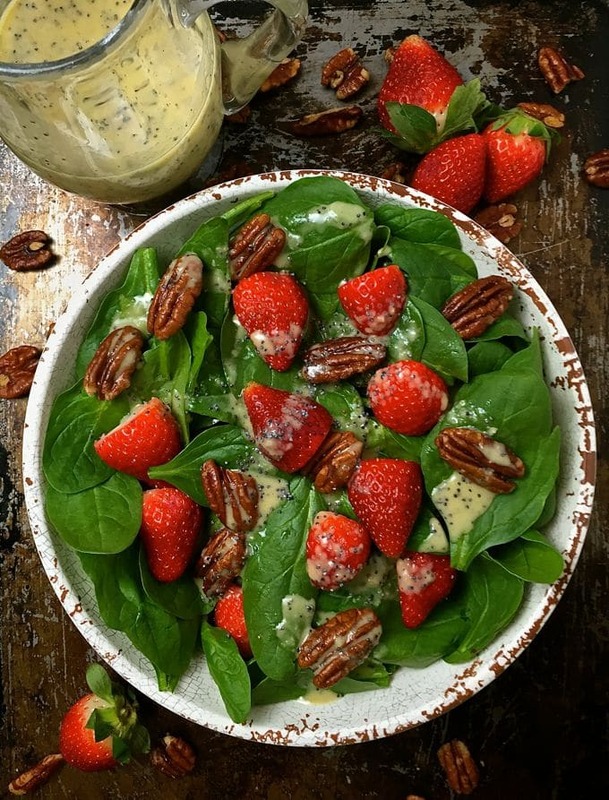 The contrast in color between the spinach and strawberries makes this an especially attractive salad and my homemade poppy seed dressing which only takes a few minutes to prepare sends it over the top. Of course, you could also use your favorite brand of bottled poppy seed dressing too! This nutritious and delicious salad takes only 10 minutes to prepare and is loaded with Vitamins A and C and, a single serving with the dressing contains only 289 calories. 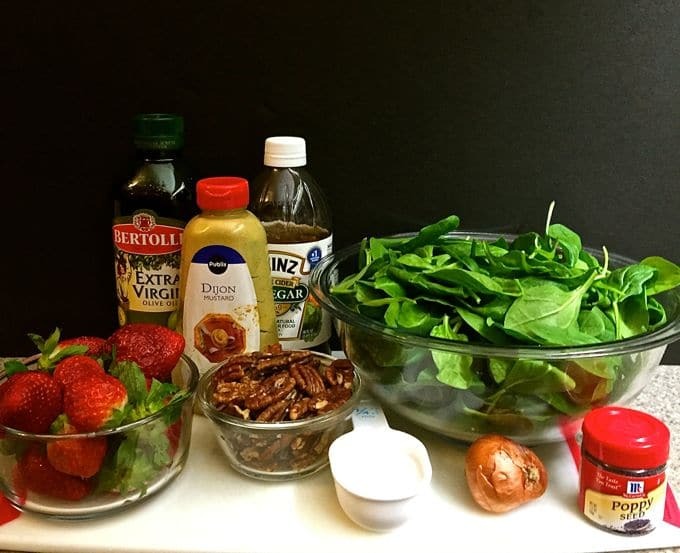 There are three ingredients for Spinach Salad with Strawberries and Pecans. And, you guessed it, the ingredients are a bag of raw baby spinach, strawberries, and toasted pecans. 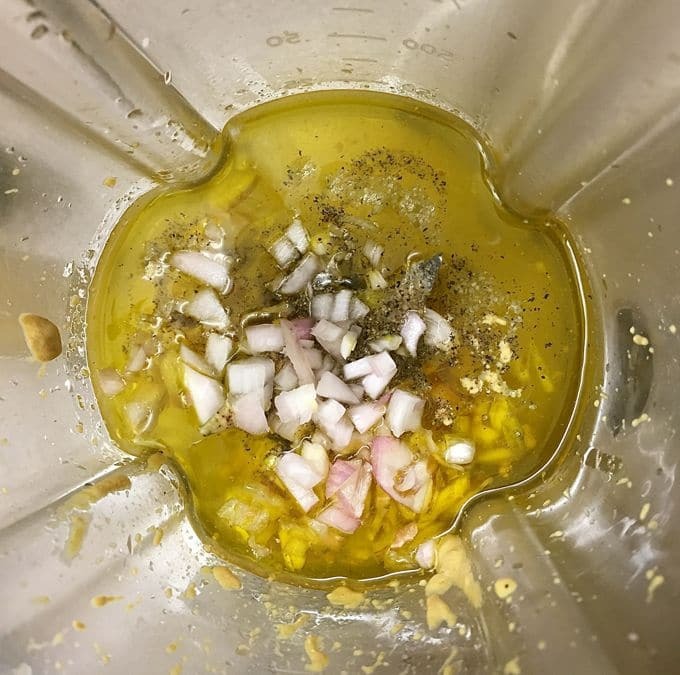 If you would also like to make the dressing, you will need apple cider vinegar, extra virgin olive oil, granulated sugar, Dijon mustard, kosher salt, ground black pepper, a shallot and poppy seeds. To make this tasty salad, place the spinach in one large serving bowl or divide it up into individual bowls. Top with strawberries and pecans. At this point, if you are using purchased bottled poppy seed dressing drizzle it over the top and serve. If you are making the homemade poppy seed dressing and I hope you are, all you have to do is place all of the ingredients, except the poppy seeds in a blender and process until smooth. Then you add the poppy seeds and combine. That’s it! I told you it was easy! If you made the homemade poppy seed dressing, drizzle it over the salad and serve immediately. This healthy, quick, easy and delicious salad with poppy seed dressing is loaded with Vitamins A & C. One serving with dressing contains only 289 calories. Place spinach in one large serving bowl or divide up into individual bowls. Top with strawberries and pecans and drizzle with poppy seed dressing. Place all ingredients except poppy seeds in a blender and process until smooth. Add the poppy seeds and combine. To toast pecans, preheat the oven to 350 degrees F. Put the pecans in a single layer on a baking sheet and toast for approximately 10-15 minutes. Start checking them at 10 minutes and then at 1- minute intervals to make sure they don't burn.